Istanbul is currently a city of parallel realities. In daily press conferences - and on his Twitter biography - Ekrem Imamoglu of the opposition CHP party says he's the new mayor. Preliminary results from the election board show he won the local election here last weekend by some 25,000 votes. President Erdogan, it seems, is not ready to let go of Istanbul - Turkey's economic powerhouse and his home city, which he himself once ran as mayor. "It's not polite behaviour," Ekrem Imamoglu said of the AK Party posters. "We have the results from the electoral board and we know who is in the lead," he told me in a BBC interview. Image caption AK Party posters have gone up across the city saying "Thank you Istanbul"
The AK Party says invalid votes across polling stations have jeopardised the result, calling it "the biggest stain in Turkish democratic history". "Of course I don't agree," says Mr Imamoglu. "Up until yesterday, the government and the ruling party were claiming that Turkey had the most credible voting system and they were giving it the highest praise. One million people were on duty at polling stations that night. "If there was any suspicious activity, they would record it and make a written report - that's the official procedure here. "Now the only explanation I have is that they are making excuses for their failure." And in the 2017 referendum on changing Turkey's political system to favour President Erdogan, the state-run election board ruled during counting that unstamped ballot papers would be accepted. Opposition parties again cried foul - but were quickly shouted down by the government. 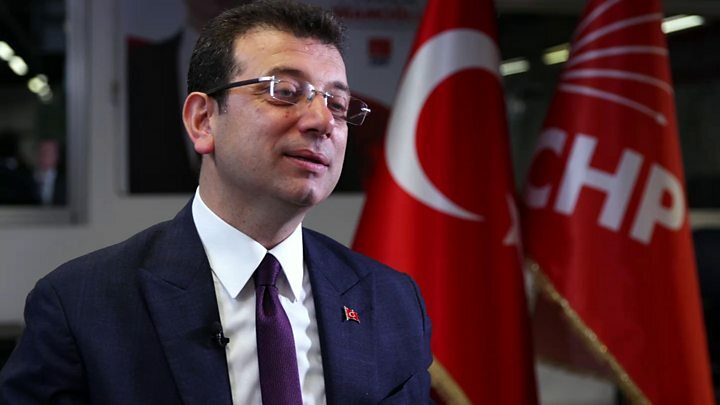 So is it, I ask Ekrem Imamoglu, the beginning of the end of the president's hold on power. "Everything comes to an end," he replies. "Parties, governments, life itself. Mr Erdogan has finished his 17th year in power. There are problems and things we don't like - but it's a political success. Of course there will be an end to it one day." The CHP's apparent success in Istanbul and Ankara has rejuvenated the opposition long written off as moribund and fractured. And it has broken Mr Erdogan's aura of invincibility. "God knows," he says with a chuckle.